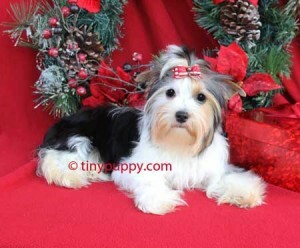 This beautiful Biewer Yorkshire Terrier Boy is Baby Brett. Brett is an absolute doll. He is very calm and loving. He loves to cuddle in your arms. He has a very thick beautiful coat like his Mother Sakyra. His mom is 4.2 lbs and his dad is 4.8 lbs. He loves to play with his toys and is already chasing a tiny tennis ball. His Champion Sired Mother is out of Art of Highclass Jumping Jo Jo. She also has a World Cup Hessen Champion in her 3rd generation and 10 champions in her 3 generation pedigree. Sakyra was born in Hungary and imported from Germany. She is one of the most loving Yorkies ever.